The transition from one generation to the next can make or break a family business; and as the 'baby boomers' hand over to the 'millennials', the risks of getting it wrong have never been greater. 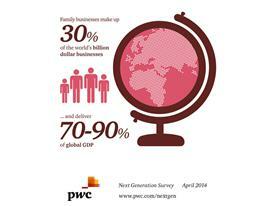 The results of new research by PwC, talking to more than 200 next generation family members likely to take over the family businesses in 21 countries worldwide, has led to the publication of Bridging the gap: Handing over the family business to the next generation. This survey looks specifically at the issue of succession: how family firms are planning for this, how the next generation views this, and the challenges all family firms face in implementing this. •	The communications gap that can open up between parents and children at whatever age and even in the most successful businesses. Says Henrik Steinbrecher, PwC Global Middle Market Leader: "The transition from one generation to another has always been a potential fault line in the family firm, but never more so than now that the 'baby boomers' get set to hand over to the 'millennials'. The world has changed out of all recognition since the current generation took over, and the pace of change can only accelerate in response to global megatrends like demographic shifts, urbanisation, climate change and new technology." 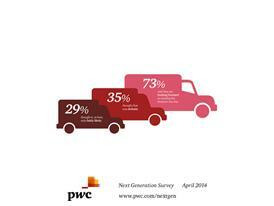 The PwC survey suggests that the handover for 'first generation' businesses – those making the transition from start-up venture to family firm - is more fraught. Those taking over under these circumstances are far less enthusiastic about the prospect; 20% say they're not looking forward to running the business one day, compared to 8% for respondents as a whole. 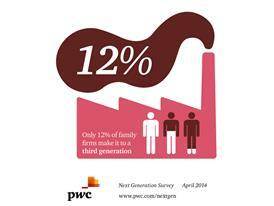 But there's no doubting the ambition of those of the next generation who have decided to go into the family firm. 86% of those surveyed want to do something significant and special when they take over, and 80% have big ideas for change and growth. Some want to launch new products or ventures, or make changes to where and how the business operates; others want to invest in new technology and explore new approaches to marketing using social media. Many (14%) of the next generation have taken business degrees to help prepare themselves for succession or management and training courses (34%), and they're looking to apply what they've learned to the family firm. They want to implement more rigorous processes, especially around disciplines like finance and budgeting; they want to clarify roles and responsibilities and document them better; and they want to update their IT systems to take advantage of the opportunities opening up through digital technology. Bearing the family name is not enough on its own to impart credibility, with many of the next generation thinking it can even work against them. 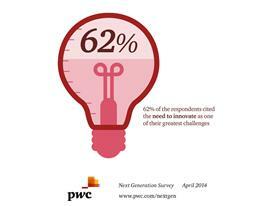 88% say they have to work even harder than others in the firm to 'prove themselves'. 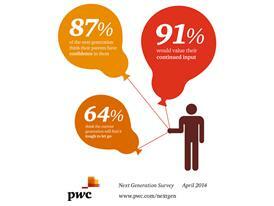 59% consider gaining the respect of their co-workers is the single biggest challenge they face. Promotion to CEO is no longer automatic for the next generation, with a growing number of family businesses being prepared to make tough succession decisions. The survey revealed that 73% said they were looking forward to running the business one day, but only 35% thought that was definite, and as many as 29% thought it at best only fairly likely. 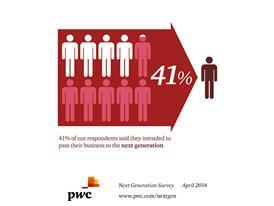 The PwC survey shows that it is increasingly common to seek work experience outside the family firm. Only 7% of the next generation had gone into the family business straight from school, as their parents and grandparents typically did. 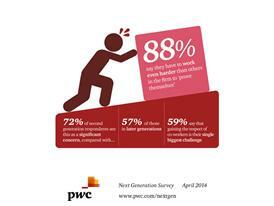 31% went to university first and 46% had worked for another company before taking a role in the family firm. There's a tendency for some in the older generation to overestimate how well they have run the business, while underestimating their children's capacity to do this as competently as they did. 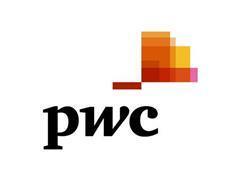 Says PwC UK partner Sian Steele: "Members of the current generation often comment that their children aren't sufficiently entrepreneurial and aren't prepared to put in the long hours they did to build the business; while down the hall their children are wishing their parents would embrace the possibilities of new technology, and be more receptive to new ideas. The survey reveals that 87% of the next generation think their parents have confidence in them and 91% would value their continued input. 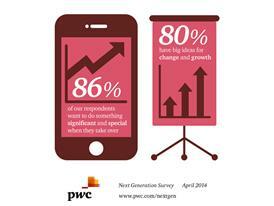 But as many as 64% think the current generation will find it tough to let go. Concludes Henrik Steinbrecher: "The stakes are high when it comes to dealing with succession, particularly when you take into account that family and privately owned businesses make up 30% of the world's billion dollar businesses, and deliver between 70 - 90% of global GDP. The firms that manage succession well are those that plan many years ahead - ideally, five to seven years in advance - accompanied by 'sensible conversations' that address roles, responsibilities, and timings."